To seize a challenge, our species seems to require three key ingredients. And, when it comes to making democracy a reality in America, we've already got them met. In 1999, Dee Hock, founder of Visa, quipped, “It’s far too late and things are far too bad for pessimism.” But 18 years later, pessimism can feel like the new realism. After all, just three Americans control more wealth than the bottom half of us. In last year’s election, less than 1 percent of Americans provided most of the $6.4 billion in campaign spending, worsening an imbalance in political influence that’s long been with us. Even in the 1980s and 90s average Americans, according to a data-deep study, exerted “near zero” influence in Washington. In fending off despair and effectively taking on democracy’s degradation, one insight has helped us a lot: that it’s not the magnitude of a challenge that crushes the human spirit; rather, it’s a sense of futility that does us in. Homo sapiens evolved, after all, as doers and problem solvers. Yet, to seize a challenge — and certainly one as mammoth as building a strong, inclusive democracy — our species seems to require three ingredients. First, we must believe that meeting the challenge is essential; second, that it’s possible; and third, that there’s a meaningful place for us in the action. With all three, humans have proven to be unstoppable. History shows us that democracy is not simply a “good” thing. It is the only approach to governance that can bring forth the best in us while keeping the worst in check. To make our case, consider three anti-democratic conditions shown time and again to bring out the worst. One is concentrated power. From Nazi Germany to Stalinist Russia to Mao’s China, “good” people commit unspeakable acts. And concentrated power measured by economic inequality — typically translating into political power — saps the life out of a society. Social epidemiologists in the United Kingdom found that economic inequality strongly correlates with a vast range of social and physical ills, from homicide to mental illness. Also eliciting the worst in us is secrecy. Before the 2008 financial collapse, bankers were feverishly pushing risky financial “products,” and among their creators a favorite slogan was I.B.G. Y.B.G. : “I’ll be gone, you’ll be gone.” Its meaning? The traders knew they would be long gone from their posts by the time their schemes went south. When we humans believe no one’s watching, we’re vastly more likely to cheat. And only accountable democracy can ensure transparency. A third anti-democratic condition bringing out humanity’s worst is a “culture of blame.” When people jump to finger-pointing before exploring shared responsibility, ongoing conflict is certain; and time spent pointing fingers is time lost from actually solving a problem. Humanity’s tendency to prefer those like us and distance ourselves from those perceived as “the other” also brings real harm, including the limiting of others’ democratic rights. Less appreciated is how othering diminishes all of our lives as the gifts of those excluded are denied their full flourishing; whereas diversity, social science confirms, enhances creativity, innovation, and our overall capacity to solve problems. But humanity doesn’t have to stay locked in this three-pronged trap. Democracy embodies their opposites. It is the only form of governance enabling us to create and protect the positive conditions shown to elicit the best: the dispersion of power, transparency, and acceptance of mutual accountability — not the blame game. These conditions also make possible meeting human requirements for thriving beyond the physical: our need for connection, meaning, and a sense of agency. Once we believe something is essential, we don’t need to know that its realization is certain or even that our odds are great in order to jump into action. We need only believe it’s possible. To believe that democracy is “possible” we need some level of confidence that humans come equipped for it and that history offers proof of success, however imperfectly, of at least its key elements. Evidence that we humans come equipped is strong. Democracy requires a deep sensitivity to fairness, along with capacities for empathy and cooperation. Fortunately, a growing body of science shows that all three are human qualities. Research shows that even toddlers rush to help others without prompt or reward; and fMRI scans recording the brain activity of subjects competing and cooperating find that cooperation stimulates our reward-processing center in ways comparable to eating chocolate! On our innate sense of fairness, even the supposed godfather of greed, Adam Smith, wrote well over two centuries ago that humans feel “in a peculiar manner tied, bound and obliged to the observation of justice.” Even capuchin monkeys demonstrate measurable sensitivity to fairness. In one famous experiment, they rebelled against what they perceived as caretakers’ unfair treatment. And what about proof that those capacities can generate progress through elected government that’s accountable and inclusive? From 1933 to 1938, our federal government created fairness rules — including Social Security, the right of workers to organize, and a legal minimum wage, dramatically narrowing the gap between most of us and a tiny minority at the top. Broad-based economic prosperity followed. From 1947 to 1973, median U.S. family income doubled. In striking contrast to recent decades, every economic class gained during this period, with the poorest advancing the most. Outside the United States, George Lakey in “Viking Economics” notes that some Nordic countries were among Europe’s most unequal a century ago, but citizen “movements . . . challenged a thousand years of poverty and oppression, took the offensive and built democracy.” Today, most Nordic democracies boast voter turnout of 77 percent or more, compared to about 56 percent in the United States. Often Americans dismiss Scandinavia’s social advances because they believe such gains come at the expense of economic dynamism. Yet, in the 2016 Global Innovation Index, Sweden ranked second while the United States ranked fourth. Three Scandinavian countries made the top 10. Finally, to take on a colossal challenge, we humans must see a meaningful place for ourselves in the action — exactly what is increasingly available within an emerging Democracy Movement. It is a grassroots “movement of movements” enabling Americans committed to the broadest array of issues to also work on the root crisis — democracy itself, the mother of all issues. And, in just the past few years, though largely invisible, this movement is succeeding in a range of reforms for inclusion and accountability, from reducing the power of money in politics and automatic voter registration to ensuring fair and representational redistricting. So, in this perilous moment, let us pause to register some good news. The three conditions humans need to accomplish what might seem impossible are met. Democracy is essential. It is possible. And achieving it is a daring and noble calling in which a rising Democracy Movement enables each of us to enlarge our lives with power, meaning, and connection. In other words, we have what it takes to make history. Adapted from “Daring Democracy: Igniting Power, Meaning, and Connection for the America We Want” by Frances Moore Lappé and Adam Eichen (Beacon Press, 2017). Reprinted with permission from Beacon Press. 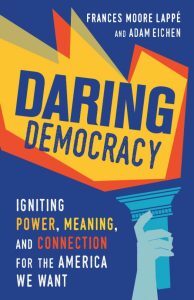 Frances Moore Lappé is the author of 19 books, including the three-million copy "Diet for a Small Planet" and her latest book "Daring Democracy: Igniting Power, Meaning, and Connection for the America We Want," coauthored with Adam Eichen. Frances is co-founder of Food First and Small Planet Institute, and is the recipient of 18 honorary degrees and the Right Livelihood Award, often called the “Alternative Nobel.” Adam Eichen is a democracy fellow at the Small Planet Institute and a member of the Democracy Matters board of directors. Now I’ve lived twice as long as expected, and I believe that’s related to my not needing guarantees in order to “love life enough to struggle.” When I look at the Global Nonviolent Action Database I see the same thing — people often struggling against long odds, and daring to commit, big time, and sometimes actually winning. For that matter, here in Philly we just saw our Eagles do the same and win the Super Bowl! Great essay. However, there is root cause of USA losing its form of “democracy”. In passing I must say that I have not yet met any born again red blooded yankee who claimed they had a “Democracy” but a Republic wherein they cede their agency to the elected persons. In between they gladly waved the flag bloodied by wars they claim they did not want. But then how do you explain to me that The Post demonstrates how “they” have lied repeatedly over decades to wage war. For what, for whom and whatever for? Kind of violence “they” carry out in the name of the “people” ought to make the “people” bring “them” down from their seats. BUT NO. That has never happened: never! Unless you can get to the root, real root of this, ‘they” will continue to collect funds from the “people” & plunder rest of the world for some ostensible “US interests” and then you see “people” gleefully nodding their heads in cheerful military parades. In Rome, people wanted wars so youth got employed and got the loots. How is it different now? I will only give you tangential reason for War mongering by “them”: look into prevailing religious blindness! This alone has rendered Middles East a vast land contaminated by undegradable chemicals even God’s chosen people wont escape their long term catastrophic effects. And there is no sign of abetting this madness. let us FIGHT Nonviolently THAT. Before other regions go waste by similar emulated blindness by even more ignorant population. Let the thugs of today not make a small group of proto-Nazzi/fascistas that carries to disaster across lands. “Those people” only will drift endlessly towards the looters hoping to eke out a substandard living amidst scorn & hat & gun violence.